This week’s challenge was to share an example of ergonomics training. 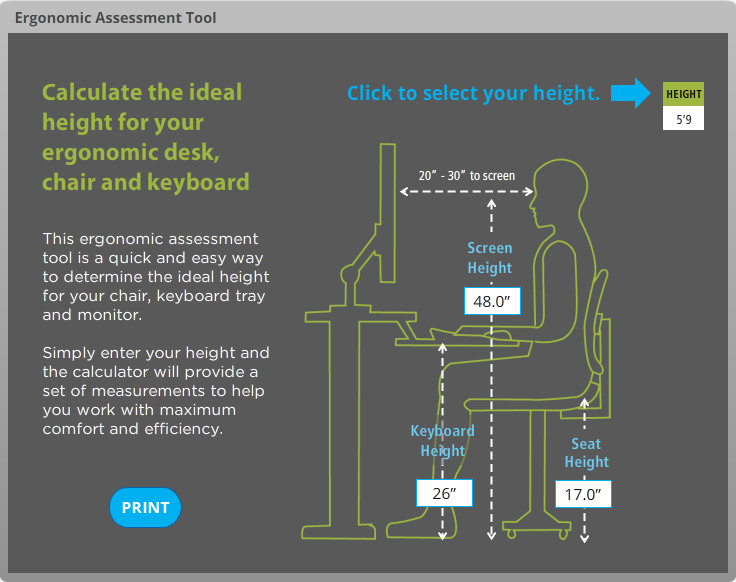 I wasn’t sure what I was going to make at first, until I found a website that sold ergonomic office equipment and noticed that they had a tool that would give you your correct keyboard, chair and monitor heights based on your height. I decided that I would try to reproduce that in Storyline 2. It was a very easy interaction to make, but it seems to look more complex than it actually is. Below is a Screenr tutorial that I made to explain my process. Here’s a link to my project I think it turned out well, my process is in the Screenr below. Wonderful Tutorial! It’s helpful to see another persons process. I’m always curious where people find inspiration and resources. I’m attempting to beef up my Photoshop and Illustrator skills. I see you traced over an existing image and altered it. I always have a difficult time figuring out the images I’m going to use. Thanks for the tips. Thanks for your kind comments Chris. Photoshop and Illustrator are two good skills to have. What I like about drawing in Illustrator is that it’s more precise than PowerPoint and it’s very easy to make changes or combine things from different images. Thank you so much. I’m glad that you liked it.